While I was away from work and Vancouver earlier this month, I was checking work email and saw that staff in the Vancouver office of my firm had the opportunity for a free stay at the Fairmont Chateau Whistler. All we had to do was fill out a Survey Monkey and without thinking long and hard and quickly running the offer by NPY, I requested a Saturday night stay. I thought the volume of requests would overwhelm the number of rooms available, especially on Saturday night, and it would go to a lottery. I didn’t get to see behind the scenes as I might have had I been in the office, but I got the night I requested. A free stay in Whistler – we just had to get ourselves there, pay for parking and pay a premium for food up there! Over the week I was back, the days leading up to Whistler Weekend, I heard people around the office talking and there was such a good uptake in the offer, our travel people had to draw up an FAQ to address common questions and we were reminded that while there, we are representatives of the firm thus we should continue to follow our Code of Conduct. It doesn’t rain but it pours. As it turns out, I will be in Whistler twice within three weeks. In the past, I’ve gone on average once every two years. But each of these two trips promises to be different. In June, it will be for a 10K race and with a girlfriend. This time, it is with no itinerary (kind of) and with NPY and the kid. The last time I was in Whistler was almost exactly two years ago, when E was still inside but making his presence known! And, when I saw the work email with the hotel offer, I quickly realized that I could be away from Vancouver on Mother’s Day. Hell, yes. My thoughts on the “holiday” are at the end of this post. It is interesting to explore different hotels in the Fairmont chain. The chateau aspect kind of escaped me. I suppose it was suggested in the facade but a modern sort of chateau. The lobby-common space felt like a luxurious lodge with super-high sloping ceilings, lush rugs and cozy sofas all about. The first thing we did in Whistler was have lunch at Crepe Montagne and we already ran into a co-worker and she recommended checking out the hotel amenities. For starters, flavoured water. (Berry was the winner over citrus and apple mint.) I certainly did plan on it after reading up on the website. We were assigned a standard Fairmont Room with a king sized bed (upgraded to mountain view!). I checked in while NPY sat with E napping and dropped off some bags in room 646. My first thought upon entering the room was that the entryway to the room smelled like urine. It wasn’t so bad in the room. The bathroom was gorgeous and spacious with a new countertop, shower and soaking tub. I didn’t mention it to NPY but he remarked on the scent so we requested a room change. Our new room (938) had a non-upgraded bathroom. Not as spacious but not horrible, relatively dated countertop and only a shower. However, it was still a slate tile shower stall and it was a long shower (not square) with a rainfall showerhead – it just didn’t drain too speedily. At home, I’m experiencing draining problems and thought I was getting a day off from it! Otherwise, the bed was super comfortable – we have a king size bed at home and practical cooling gel topped contour pillows – but it’s not the same! In the lobby, I would run into colleagues each time. But we did not take over Whistler in general. My biggest indulgence was to nip away after E went to sleep and NPY had no other thing to do but mind him and play on his phone in bed. I checked out the heated outdoor pool and hot tub. I heard the pools were busy during the afternoon and evening before dinner and it was relatively quiet in the two hours before the pools closed for the night. I merely floated around the pool and in the hot tub, chat with a colleague and another visitor from Burnaby who brought his mom to Whistler as a Mother’s Day treat. By no means did we figure out what to do with kid in tow. I suppose we could have gone snowshoeing, maybe. Or a mini hike. But instead we just walked along the Village Stroll and got slightly bored, haha. For E, the complimentary hotel shuttle ride was an adventure. He was happy to stand and wait for it to arrive and so excited when he spotted it. We test his memory of the experience every day, asking him if he recalls the shuttle bus colour (brown). We checked out the playground and at just five feet, I can follow him through the younger kids play ground but then there were entrances I couldn’t get into and I would dash around to the other side in fear if I take my eyes off him, some kid would swing from above and kick him the face. None of my fears realized, thankfully. 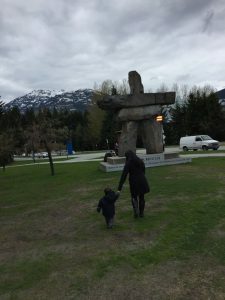 I was also obsessed with taking a photo with the inukshuk near the Whistler Conference Centre (near the shuttle stop) and one oblivious guy with his kid parked themselves there and were thus photographed by every visitor wanting to snap a shot with the inukshuk. I think it will be a lot more fun in another year when E can bike or sit atop a paddleboard or keep up better on a hike! Can you believe that of the five places we got food from, I only have photos from two? Life has changed so much! Haha. I learned about Crepe Montagne during another work trip, four years ago. It was too busy that day and then NPY and I missed out two years ago. This year, E is our alarm clock and I merely needed us to get to the restaurant safely before they stop serving at 2:30 and we don’t spoil our appetites during our usual pit stop in Squamish! As luck would have it, we were seated right away when we arrived shortly after noon on a Saturday. The wood booth seating was clean but rustic feeling and the whole place is cozy feeling. E was in no mood to sit in his booster seat so I held him standing most of the meal. That kid. Looking at the menu again, I remembered my previous reaction to it. What should I order when it’s so expensive?! I strategized for us that we would order one savoury crepe (may as well make it seafood, at $28) and a simple sweet crepe with strawberries and Nutella ($10.50) to balance the costs, and request that we are served the savoury crepe to share first then the sweet crepe. I bet this is not a novel idea at all. While the portion looked modest, the seafood crepe made with buckwheat batter and filled with scallops, baby shrimp and langoustina lobster was really tasty. And then the crepe with sweet strawberries in syrup and Nutella was like having a lunch-time dessert. I do not believe that Coast Mountain Brewing had a brewery open to the public two years ago when we last visited. Our travel life seems to be Before Craft Beer and After Craft Beer. 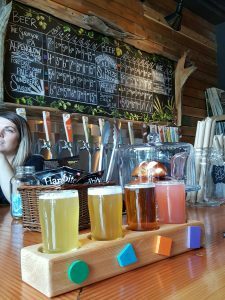 In 2015 when we were last in Whistler, NPY was into craft beer for about a year and we went to Whistler Brewing Co. in Function Junction, a short drive from the Village. At this point, they are the established brand with iconic cans with illustrated graphics. My introduction to Purebread (which started in Whistler) was two years ago because it is located across the street from Whistler Brewing. I became familiar with the brand but didn’t find the display in the shop at that hour I dropped in to be that impressive. It was only back in Vancouver when I went to their Gastown location that I was floored by their selection and it’s somewhere I wanted to bring Lil Sis for coffee last year but schedule did not permit. While their Whistler shop and display case is smaller than that in Gastown, I think the selection was bulked up that day and I picked up a few treats hoping it wouldn’t go to waste as sometimes I shop for snacks while traveling but we don’t get around to eating them! We tried OMGs (which almost lived up to its name), a tomato ricotta tart (does not travel well at all), and a vegan sundried tomato basil scone (it was for E who decidedly did not enjoy it and to me had a taste of baking soda/powder or something). While NPY and E poked around the cheerful gift shop, I lined up and checked out the flavours. Since it is only $5.45 for two scoops (which aren’t massive and the ice cream isn’t as dense as we are now used to), I ordered a chocolate-rim cone for NPY’s enjoyment. The flavours I got this time are Chunky Chocolate Mint (mint ice cream, chocolate marble and chocolate flakes) under Fluff ‘N Udder (chocolate ice cream, marshmallow swirl and peanut butter cups). I allowed E to dip into the cone with a mini tasting spoon and taste as much as he wanted – which wasn’t much – and he was stuck with evidence the rest of the day in the form of crusted marshmallow on his lips, haha. I thought that this time around, we might try Sushi Village. You know, order some for take out, chill out in our room. E gets some Asian food and it’s fairly budget friendly. But somebody told NPY never to get Japanese in Whistler so we minded that and he suggested The Old Spaghetti Factory. But that’s so… okay, fine. It’s the most reasonable place where E can make a mess and have noodles to eat and we know what we’re getting even if it isn’t awesome. Honestly, (1) trying to go somewhere cool these days with toddler in tow is asking to have a miserable time when he’s restless by the time we order and (2) if we want to renowned Araxi or Bearfoot, we can zip up to Whistler any time and arrange that the kid stays in Vancouver – it is a-okay to go for consistency. NPY ordered the Pot Pourri with meat, mushroom and clam sauce for a variety for himself and E benefited from the different flavours as well. I ordered the spaghetti with browned butter and Mizithra cheese thinking I was ordering something new to me but I think I’ve ordered it before. It’s terribly dry and that makes it seem like I had way more pasta than NPY had. Back at the hotel, I ran into colleagues who brought their kids and had dinner. Where else, at The Old Spaghetti Factory as well. Guess that’s our best option for the next, oh, five years when kids are restless. 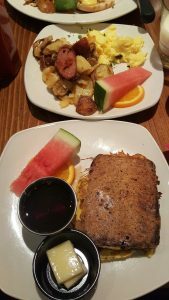 In a list of brunch recommendations in Whistler, Wild Wood and Wildflower routinely come up. The former is in Crystal Lodge, located along the Village Stroll while the latter is in the Upper Village in the Fairmont where we were staying. 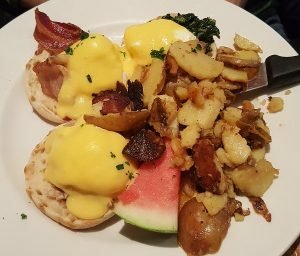 The Wildflower was having a Mother’s Day Brunch Buffet for $69 per person (complimentary mimosa for mothers) and I didn’t even consider that maybe they were serving normal breakfast items but we went to Wild Wood which has a choice of nine eggs Benedicts. NPY likes eggs Benedict. I liked the menu at Wild Wood. Besides nine eggs Benedict choices, you can get a sampler where you can try three and thus split that between the two of us. There is a decent kids menu with four of five items all priced at $5 so I could also get at taste of eggs-potato-sausage/bacon/ham, which is the portion E didn’t eat. And I could order just one slice of their banana bread French toast. Nine Bennies choices but all topped with the same Hollandaise sauce. Crab Benny was okay with shredded real crab meat. Florentine Benny was tasty with creamed spinach. Bacon Benny which NPY left for me was loaded with bacon – yum. For some reason, I did like the coin-shaped Pemberton potato hash – it was markedly different and was tasty without seasoning. I can’t remember if I ordered farmer or country sausage- what confusing names. The banana bread French toast with real maple syrup (upcharge) was a lovely cap on the meal. Okay, here’s my mind dump about the whole thing, updated. I did blog about it in 2015, shortly before my own status changed. At the risk of sounding like a hypocrite given how I did mark my first Mother’s Day last year with brunch, a 5K walk (hey, coincidentally also to do with Fairmont), and NPY got me the gift of a smartwatch, I don’t want to celebrate Mother’s Day. Blah blah, mothers should be recognized far more often for their contribution to the family that far exceeds an equal division of effort than one cheesy day of the year. I’m fine with the Happy Mother’s Day sentiments that abound in social media and chat groups with friends, seeing my mom friends be showered with gifts and dinner. But I don’t want to go for dinner or deal with dining establishments on that day or be roped into early or belated celebration (because the day is over, too). I’m not in the mood. For over 25 years, my mum and dad work like crazy the week leading up to Mother’s Day and on the day of, deal with the stress of pushing out food orders non-stop and in the process get yelled at. Sometimes for approaching valid reasons but often not. I’ve worked for about 15 of those 25 years and finally don’t need to by virtue of having a kid. It’s no celebration to me and certainly not to see my mum work like crazy and get yelled at and our restaurant reputation up for a beating every Mother’s Day by customers who aren’t fully empathetic (or just plain mean). I don’t mean to celebrate Mother’s Day and willingly (happily) go for dinner until my parents are retired and finally get to enjoy these fake holidays in peace and relaxation. That’s my revised stance.